This school by Studio Weave features a scalloped roofline and double doors that slide back to connect the classrooms with a woodland setting on the outskirts of London. The Hackney-based architecture studio created the classrooms with curving roofs for Belvue School, a mixed-gender secondary school for children with moderate to severe learning difficulties. The school had previously raised enough money to install two shipping containers as support buildings for the adjacent woodland, which it manages as an educational nature reserve. Studio Weave was asked to produce a more ambitious space for extracurriculars on a similar budget. "Our approach to this project was about more than just designing a new building for the school," the architects said in their statement. "It was about creating a narrative for the woodland that would open up imaginative ways of engaging with this newly acquired natural asset." The two woodland rooms sit apart from the main school buildings across a colourful playground. As part of the design process the architects and the school held story writing workshops with the students to help conjure up "a collective narrative" for how the new space could interact with the woodland. "We identified that the boundary between the playground and woods marks the border between familiar school territory and the magical, mysterious world beyond," said the architects. "At this very important threshold the woodland rooms act as a 'gatehouse', and symbolise the entrance to another world/secret garden." The London-based architecture practice led by Je Ahn has a reputation for crafting unusual spaces in rural locations. For a hikers' shelter near a river in Bordeaux it raised a five-sided building with a hooded roof up on stilts, and for an art studio on the west coast of Scotland they suspended a twin-gabled form halfway over a brook. 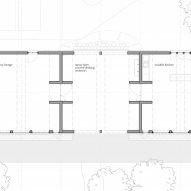 For Belvue School the architects added sliding doors that can be opened out to let the woodland in or shut to create an enclosed space. A small arched doorway, like a postern gate in a castle door, allows students to come and go when the doors are closed. The frame is made from larch wood with cedar cladding, and birch plywood for the interiors. Storybook windows with circular, gabled or flat peaks are set at different angles across the wooden facade, with contrasting yellow frames, with sawtooth sills that match the angled tips of the wooden slats around the barn doors. Concave roofs over the classrooms create comforting lower ceiling heights around the entrances, opening up towards the centre of the room. Skylights set into the sides of the flattened peaks of the roof allow natural light to suffuse the rooms, and the doors and windows allow for natural ventilation. Studio Weave designed three different specialised learning spaces for the school in the 150-square-metre of classroom. Messy Barn, with its barn-style doors, allows for outdoor learning even in all weathers, with space to hang large student-made art works from the curved eaves. Next door, Cosy Lounge is used as a place for teaching, with large windows providing views of the trees beyond. The lounge area can also be used as a private sensory space for students when they need a place to be calm. Reading nooks are tucked in under the lowest parts of the ceilings either side of the windows, and a wood-burning stove can be lit to heat the classroom in winter. The Sociable Kitchen room houses a cafe, with a food preparation area and space for small groups to eat together. Studio Weave designed a custom weathervane for the rooftops, which illustrates the wind blowing a gust of wind towards a miniature outline of the new school buildings. In Salamanca, Spanish studio ABLM Arquitectos clad the ground level of a school in brightly coloured stripes of tiles and covered the top level in mirrors that reflect the sky. For a school extension in Lille, Brussels-based architecture studio LT2A added golden portholes looking into the courtyard playground.